water, originally uploaded by jahansell. This stand of barren trees (in the same spot where the "snowy" scene is) hs been there for years. A fire? In a pond? or a disease? I don't know! 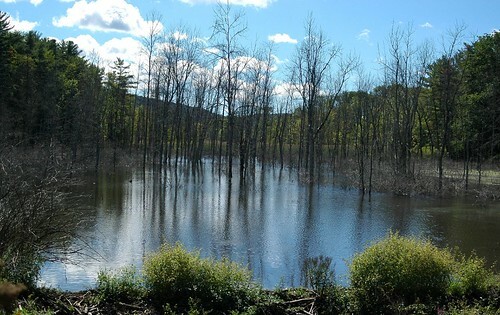 Nah, probably a beaver dam killed the trees by flooding the zone. These trees look so spooky! terry's right on....just a few years back, the water was much lower...but the beavers raised it about 4 or 5 feet(water level), there-by also covering a much broader, previously uncovered area.....thus....dead trees! great shot!